The other day I was having serious chocolate cravings. I didn’t want to bake cookies because my new silicone-finned beater blade hadn’t arrived yet (and still hasn’t). I didn’t want to make mini-pies because I was lazy and didn’t want to fiddle with mini-crusts (nor did I have any of the cheap mini Keeblers graham cracker crusts on hand). It was late, I was tired but I really needed some chocolate. Muffins are fast – just stir the wet ingredients into the dry ingredients, shove some muffin liners into the muffin pan, scoop and bake. No mixer needed and very little waiting required. 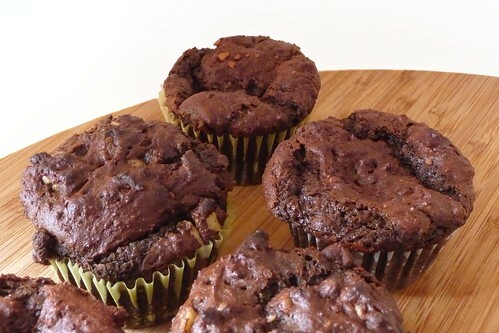 These muffins come out very rich and chocolatey. I needed two glasses of milk with my first muffin but it was oh so good. Since the batch made almost two pans’ worth, I stirred walnuts into the second batch for that nutty crunch. Even though I messed up while measuring ingredients by forgetting to halve the leaveners, they still came out beautifully. Preheat oven to 375F. Place muffin/cupcake liners in your muffin pan or grease and flour the pan. Whisk together the dry ingredients. Whisk together the wet ingredients in a separate bowl. Add the wet ingredients to the dry ingredients and stir just until the batter begins to come together. Don’t worry about lumps or smoothness, just bring it together and stop. Add in the extras you want to use, stirring just long enough to mix them throughout. Drop the batter into the cups. (A disher makes this very easy.) The cups should be full. Place in the oven and turn up the temperature to 400F. Bake for 18 – 20 minutes or until a toothpick inserted in the center comes back clean2. As soon as you can, remove the muffins to cool on a rack. Serve immediately or store in an airtight container. Muffins can also be frozen. In baking, sugar is considered a wet ingredient. In other words, do the “cake test” on it. Be careful of hitting a chocolate chip which can throw off your results. This entry was posted in american, muffins, recipes, untranslated. Bookmark the permalink.